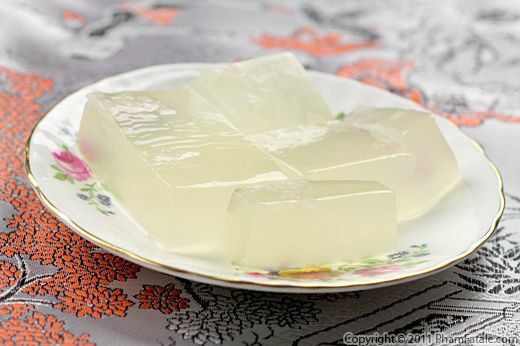 Rau câu is Vietnamese jello made with agar agar, which is a seaweed by-product, similar to gelatin (except it's vegetal). Several months ago, family friends came for dinner and brought delicious rau câu made with nước dừa ("coconut juice" in Vietnamese). We usually serve the more traditional Vietnamese dessert made with sweetened condensed milk and flavor it with layers of chocolate, mocha, pandan and sometimes durian, but I really like the flavor of this variation. I was also pleasantly surprised at how easy this version was to make. All you need is a few cans of coconut juice with pulp and agar agar. How simple is that? The coconut jello has another great advantage. It has the same texture as pana cotta, so you can serve it to children without being scared of any spilling or any accidents on your floor. I've adopted this cube version whenever I make it for kids. You can use the same recipe using your children's favorite drinks. It's mess-free and melts in your mouth. They’ll love it! 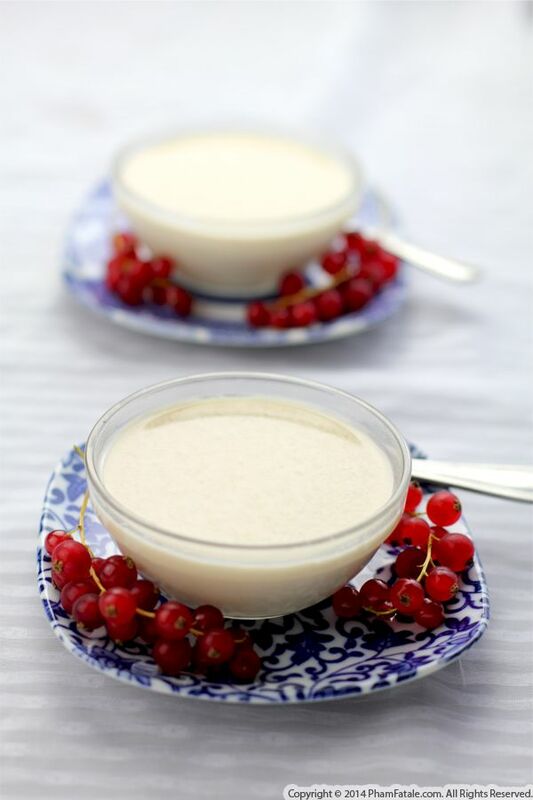 Agar agar panna cotta is my way of making a light dessert suitable for a strict vegetarian diet. Agar agar powder is a good gelatin substitute for vegetarians. It's derived from seaweed and is cooked the same way you would gelatin. 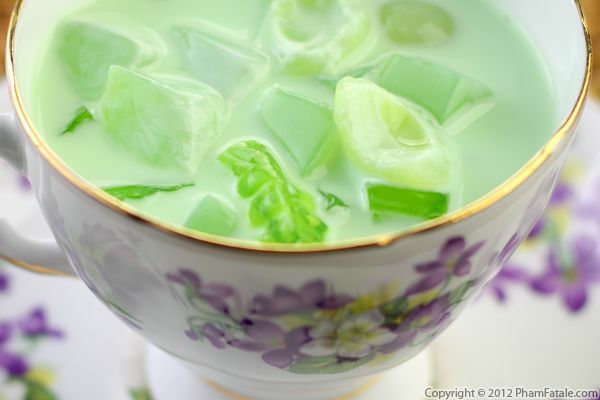 It's widely used in Asia, especially for making rau câu (Vietnamese jello cake). 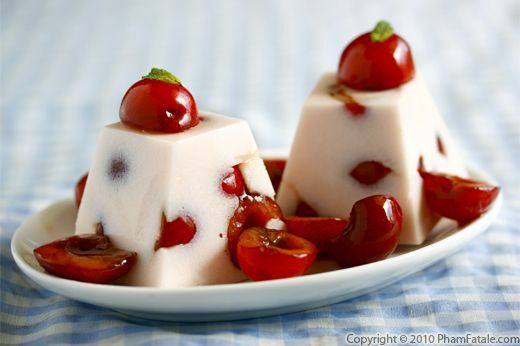 This time around I decided to flavor the panna cotta with cherries. I incorporated fresh fruit, cherry extract and a little red food coloring to make the dessert more appealing. We have some very pretty verrines which I used as the molds. It’s a tasty summer dessert with definite visual appeal! When I think of Asian sweets, the flavor that comes to mind after mango, litchi and durian is matcha green tea. I love pairing matcha with black sesame; I think the flavors go perfectly together. Lulu and the girls made a beautiful rau câu birthday cake for my birthday several weeks ago, based on a recipe I posted. Rau câu means agar agar in Vietnamese. I made a matcha agar agar jello cake paired with black sesame sauce and garnished it with fresh diced mangoes for color. The dessert tastes like a sweeten matcha green tea with a soft jelly texture.